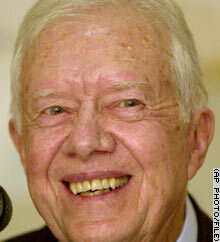 Have you ever noticed that Jimmy Carter has pointy, pointy teeth? In the above photo (copyright AP, used without permission, taken from a CNN story about Georgia wanting to claim that evolution never happened [politeness prevents me cracking the obvious joke], don’t sue me) he’s kinda got that Transylvanian thing going on. Don’t get me wrong, I’ve always liked Jimmy — he was the first US president that I was old enough to really remember what he did — but by the looks of this picture, I’d have the garlic handy if he ever came visiting.